The violin as known to many is the baby of the string musical instrument family with four strings and tuned notes G,D,A and E played with a bow. Just like babies are capable of making the deepest sounds, the violin too is considered as the stringed instrument which makes the highest pitch. Typically used in western music the violin has made its way into many musical cultures today. A person who plays the violin is called a violinist. One of the most sought after and accomplished violinists in Sri Lanka is well accredited Thushani Jayawardena. Having commenced on this inimitable journey as a toddler when she was crawling, as her father was a reputed violinist Asoka Jayawardena formerly at SLBC orchestra. For her sixth birthday she was queried to choose between a piano or a violin. She had opted for violin from that date her life has revolved around playing the violin. She is now a very competent violinist on precisely pressing down the strings to change the pitch, while her right hand moves the bow or plucks the strings. The violin sometimes called the” fiddler” is exclusively accessible when speaking about folk music. Thushani had studied music along with her father and Ananda Dabare for over ten years and with late Professor Howard Davis in London for one year. She had studied the piano under teachers Menaka Sahabandu and Ramya de Silva. She had won 1st place in singing at North London and Enfield festival music competitions in London. On the dire strength of her music endeavors had been awarded an entrance scholarship for one year at the Royal Academy in London. It is learnt that these are very competitive schools where auditions are at tall values. She recollects that she regrets she could not continue owing to dire financial constraints of her parents. In subsequent years she was an automatic choice as the violinist at Derana Dream Star and Sirasa Super Star reality competitions. Thushani had been acclaimed several times by the judge panel for her contribution as the sole violinist in the orchestra backing the novice singers in these competitions. Thushani had been a role model in this field for years. It is learnt that several children in outstations are curious on the violin after seen her performances. These young children have developed a tremendous fondness to this western instrument which many adults have failed to recognize. 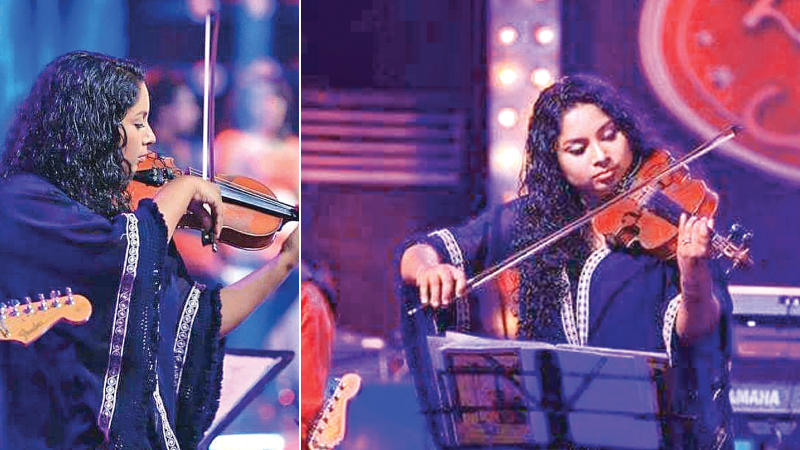 Thushani does violin classes in Colombo and Negombo for enthusiastic students during weekends which she had commenced from her tender age of fifteen years. She is a visiting lecturer at the Visual and Performing Arts university in the same field. Thushani is currently a priceless member of the Mahesh Denipitiya orchestra where fusion music dominates which should be the modern trend unlike in many other western classical orchestras. Thushani believes fusion music is the current trend hence every singer must be updated, and one needs to engage in fusion music fundamentally in a tactical manner without distorting the origins of the music traditions. Thushani’s parents are Asoka and Mallika Jayawardena.Only sister Eshani is following a degree in IT.Her husband Asiri Jayawardena an IT specialist is her greatest pillar of strength as he looks after the children when she is out playing. Her eldest daughter Gehansa is six years old a grade one student at Musaeus while her little son Liam is seven months old. All factions of followers of Thushani would have no hesitancy to wish her to be more skilled in her designated profession.